What it means to the select few that have been introduced to ProSupps ™ newest and most potent addition, DNPX, is complete and utter annihilation of fat and appetite. With thousands of fat burners on the shelves today, our founder, IFBB Pro Art Atwood knew he needed to formulate a product that combined the perfect balance of thermogenic, appetite suppressant and mental acuity. DNPX was born, and until now, only a select number of people have ever tried this extremely potent and effective formula. Fat stores beware…the X is here. Q. Is DNPX safe to be taken with coffee? DNPX should not be taken within 4-5 hours of any other stimulants or caffeinated products. Q. I’ve heard DNPX is very strong, can I take it even if I don’t compete? Yes, DNPX can be used by anyone seeking to lose fat. Q. Can DNPX be used on an empty stomach? DNPX should only be used on an empty stomach after assessing tolerance. *Blue Razz Flavour Shown. Ingredients may vary from flavour to flavour. HOW TO TAKE DNPX™: DNPX is a powerful dietary supplement and is intended for use by healthy adults over the age of 18. Do not use any other caffeine products in combination with DNPX. As a dietary supplement take 1 scoop in the morning. 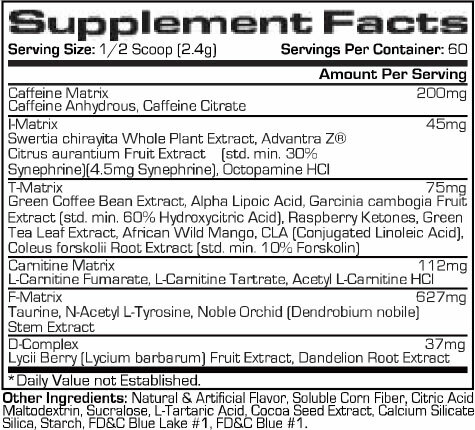 Do not exceed more than 1 scoop at a time or 2 scoops in a 24 hour period. Warning: Not for use by individuals under the age of 18 years. Do not use if pregnant or nursing. Keep out of reach of children. Do not consume this product if you have a medical condition and/or taking any prescription medication. Do not exceed recommended servings. Do not use this product if you are at risk or are being treated for high blood pressure, kidney, thyroid or psychiatric disease, anxiety, depression, seizure, enlarged prostate, or stroke. Before beginning any supplement or training program always consult a physician first.